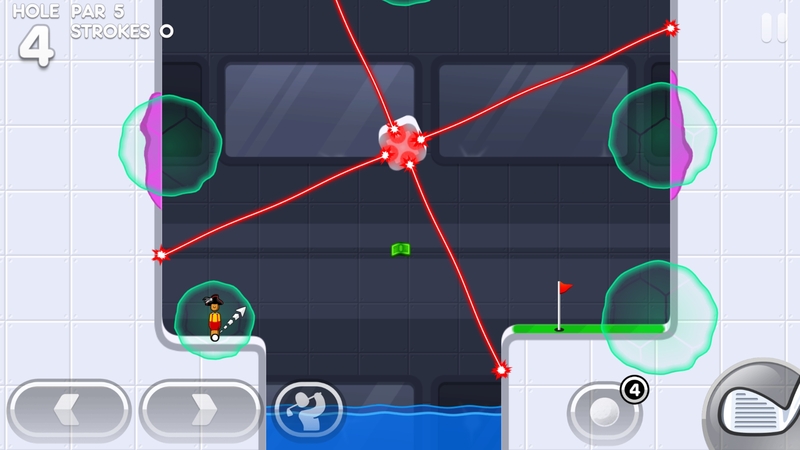 It’s been a few years since Super Stickman Golf 2 (Free) first released, and there’s been plenty of time for that game to kind of fade into memories to a certain degree, what with the constant deluge of releases that mobile gamers are beset by. So even huge fans of that game might have forgotten just why it was so much fun. And really, that’s what Super Stickman Golf 3 (Free) does best: it advances the franchise with its new spin mechanic, but also shows just how solid the core established by earlier games was. It’s just better than ever. If you haven’t played a game in the Stickman Golf ($2.99) franchise, well, this is as good a time as any, particularly with the game being free-to-play, but far from annoying about it. This is 2D physics-based golf as always, where you set your shot angle, your power, and traverse courses both vertical and horizontally-arranged in order to try and get in the hole in as few strokes as possible. It is a golf game, after all. But you get all sorts of powerups that you can earn and deploy to help get around the very difficult courses. There are new courses with new tricks, but the core game itself is largely unchanged. It’s a formula that leads to plenty of wacky happenings, can test you immensely, but lead to amazing rewards when you hit that perfect shot. Oh, and if you land cleanly in the hole, you lose a stroke. Prepare to go mad, high score chasers, and turn-based players who lose by one stroke due to a perfect swish. Noodlecake did not mess with the core of what works. The spin mechanic is what is new in Super Stickman Golf 3, and it is an amazing addition to the game. It’s a feature that more traditional golf games have had, but it makes major changes to how you approach holes with various shots. The obvious application is if, say, your shot is short on the green, you apply forward spin and you get it in the hole, or you stop a shot dead in its tracks with backspin. Many balls that would just die short of the hole now make their way in thanks to the spinning. You can alter the trajectory of shots with backspin and forespin, of course, particularly when launching vertically. But hitting the ball off of ceilings, and walls – learning how to use these effects to your advantage is the key. And what the spin does is that it makes many shots that were impossible, with intense angles, within the realm of possibility. A few holes have shots where if you can bounce on a small platform, and apply some appropriate spin, you can get right on the green with a shot that was otherwise impossible. Of course, some of the holes start to take advantage of the fact you have the spin, and makes it such that you need to at least learn how the mechanic works to do well at them. 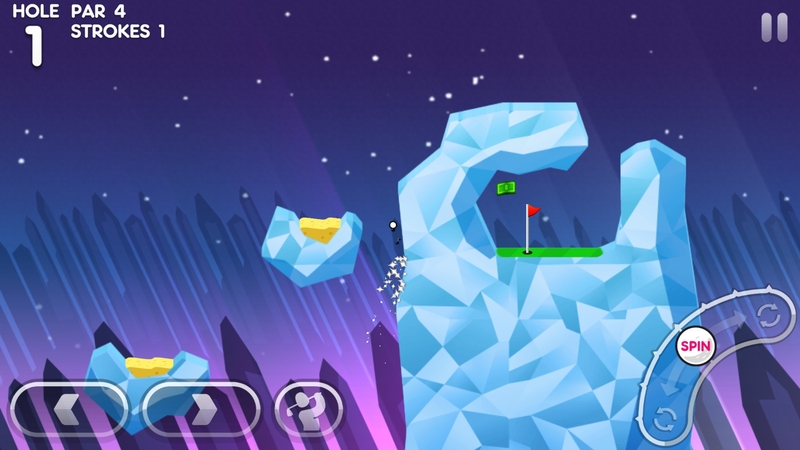 Thankfully, Super Stickman Golf 3 skips any annoying tutorial to teach you the spin. There’s a course that is centered around the spin, called Spin Land appropriately enough. While it teaches you the myriad ways to use spinning, the game makes the spin mechanic available before you unlock this course. And the Spin Land course is just like Portal Land, or other similar courses built around a particular gimmick, rather than feeling like a tutorial level you’d never play again. I will say that while spinning is available from the beginning, you will have to unlock all the powerups just as in SSG2. The downside to this is in competitive modes, where some of the powerups might not be available to you, but available to other players, creating an uneven playing field, though this is mostly just a matter of working to unlock them. You can upgrade a few of the powerups by finding them in card packs, but all must be unlocked through gameplay. You do have 20 courses to play through at launch, each with the goals to get a certain score to get a bronze, silver, or gold star, along with the “clean ball" challenge where you have to get par without powerups. Easier said than done on most courses. But the experience rewards for completing the later courses are well worth it, as they help you level up and unlock new features. The course creator isn’t done yet, but it will be available soon, with the infrastructure for the feature already in the game. A new daily race mode allows you to go up against several ghosts on a single hole in order to try and get in first place, netting bux for you, and an eventual card pack for winning 5 days in a row. Not only is there the completion of courses (and work to unlock them all) to do, but you can also compete against friends for high scores on the various courses, and there’s the exploration aspect of the bux, along with some hidden portals worth discovering. The courses are some of the best of the series – there’s not a clunker in the bunch, they’re all fun to play and each one feels like it has a unique theme and purpose in the game. The multiplayer modes are back in Super Stickman Golf 3, and while the turn-based mode is still a bunch of fun, the race mode is worthy of the most noteworthy commentary. The reason being not only that it’s still a fun alteration of the game, making the way that you tackle courses and use powerups so much different than it was before. But also, because of the many new game modes that have been added in. You have to unlock them by finding them in card packs, but modes like unlimited nitro balls, and even a Flappy Golf (Free) mode add a lot of spice to the proceedings. Oh, and you can play with no powerups at all, but where’s the fun in that? Well, if you’re really good and your opponent leans on the powerups too much, I guess it’s fun to watch them flail about, eh? The turn-based mode offers both powerup and no-powerup modes, and offers a fun twist where you can wager bux against the other player. Don’t let those matches lapse, that’s for sure! 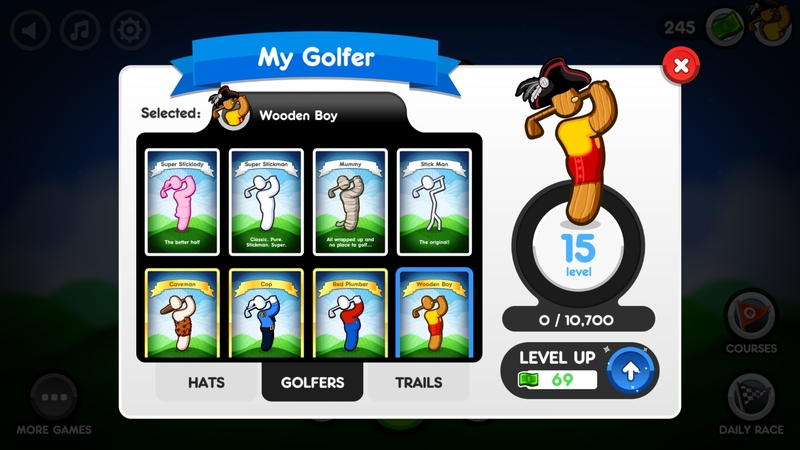 So, Super Stickman Golf 3 is free-to-play, though for most people, the permanent unlocks are the way to go. The premium mode is a must-get as it disables ads, unlocks the downloadable courses (5 of which are available at launch, with more available through the custom course creator when it’s finished), and gives you 5 card packs off the bat. Then, there’s the $1.99 XP doubler which is well worth getting, and the $1.99 last shot indicator which is helpful if not explicitly necessary. You can buy more of the game’s currency, bux, or buy card packs as IAP. However, you’ll get card packs for completing courses for the first time (including at least the downloadable courses that are available at launch made by Noodlecake), for winning the daily race mode for 5 days in a row, or by just spending 40 bux. Your rate of earning card packs will slow down, but in my experience, this is far from a practical problem, as you get bux through other methods. The downside is that there are some features that can be earned only through the card packs, and some upgrades to the powerups have to be earned through cards. Still, this is 2016, and the game gives you a lot for very little contribution. Super Stickman Golf 3 is certainly familiar, but it’s still an improvement, and still one of the most fun games you can play on mobile, period. The spin mechanic is really a fantastic addition to the game in both little and big ways. But otherwise, this game is just a refinement and iteration on a formula that works well, and bringing it back to the forefront after 3 years is more than welcome. I remember the great times I had with all of the games in the Stickman Golf series, and Super Stickman Golf 3 has hooked me just as all the previous games once did. This game is a true mobile gaming classic and is a must-download.